Everyday we receive email and phone calls with people asking questions about chess piece & chessboard sizing, as well as color matching issues. We have provided this page as a resource for answering some of these questions. It is to be used as a guideline only, since the final selection of your chess set is a matter of subjective interpretation. Our hope is this guideline will give you a starting point from which to make a proper selection for your particular taste. Of course, you can always give us a call if you have more questions than is covered by the scope of this page. After all, some of us do like to hear ourselves talk! Figure 1-1: A nice little chess set that looks balanced is a beautiful thing! 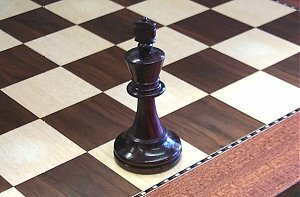 One of the most common questions asked by our customers is "What size chess board should I use for my chess pieces? ", or visa-versa. Let's examine our options together. The sizing of chess pieces to a chess board is mostly a matter of personal taste. 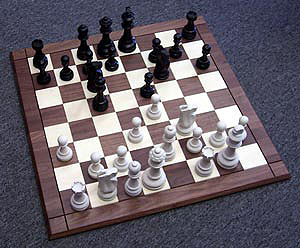 Tournament play is the exception to this, since very clear specifications are given by the governing bodies as to the specific sizes of pieces and boards. For example, the US Chess Federation, the governing body for chess in the United States has specific "Equipment Standards" outlined in their rules. 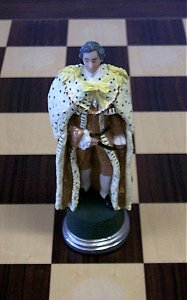 For chess pieces they specify a King that measures 3 3/8" to 4 1/2" with a base diameter of 40-50% of the height. This happens to be one guideline given for a specific application; it is used when playing in USCF sanctioned tournaments. To see how this looks refer to Fig. 1-2. You can see that the four pawn method gives a fairly balanced appearance to the set and board in this case. But what happens if your chess set has unusually wide bases on the pawns? Or what if the king has a base diameter of less than 40% of the height? Let's examine some options when your chess sets, boards, or your personal taste differs from the tournament standards. We shall attempt to give you specific examples for "Staunton pattern" pieces and "non-Staunton" pieces. Below are some examples of some "Staunton pattern" sets we carry along with sizes of boards they work with. You can also use this for reference, and comparison, on sizes, colors and dimensions within the selections. 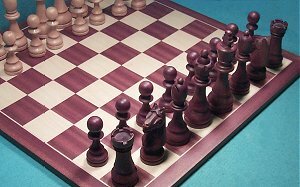 Bear in mind, the four pawn guideline may not work in the case of many chessmen available, since each manufacturer makes its pieces with different styles. Consider also your personal sense of the aesthetic. If you look at our descriptions of chess pieces you will notice that we always include the height and base diameter of the kings. This is because we have found an effective method of choosing a board for a given set of chessmen. This is called"The 75% Guideline". 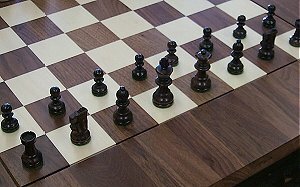 It's a simple little guideline that says the kings base diameter should be 75% of the playing square diameter of your chessboard.Simple!Well not really, there are always exceptions to any rule, but for the most part we find this works fairly well with most "Staunton pattern" chessmen. If you examine Fig. 1-3 & Fig. 1-4, you will see"The 75% Guideline"in application. This king measures 1 3/4 inch base diameter and the chessboard has playing squares measuring 2 1/4 inches. This works out so the kings diameter is about 75% of the size of the square. Figure 1-2: An example of the "The 75% Guideline"
Figure 1-4: The complete view of "The 75% Guideline"
Let's examine what chess sets would look like outside this guideline. Figure 1- shows a chess set that has pieces that are larger than the"75% Guideline". As you can see the chessmen seem crowded on the board. The result is it is difficult to play a game. It also impairs anyone viewing the chessmen from having the ability to clearly appreciate the beauty of the pieces. Conversely, the opposite is also true. Figure 1-6 depicts a set where the pieces are smaller than the"The 75% Guideline". In this case the pieces seem lost on the chess board. There is so much space between pieces, the positions during game play become unclear, especially during the endgame phase, when there are few pieces on the chessboard. Aesthetically the chess pieces also give the appearence of being not very impressive. Figure 1-6: Help! We're lost in a checkerboard sea! 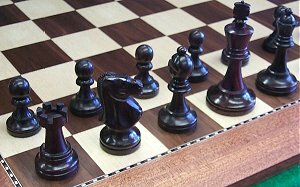 These situations occur commonly when some folks choose a chessboard to fit on a table, or some other space set aside, in their home, and do not consider the size of the chess pieces they own or intend to purchase. If you already own pieces, your choice of chessboard should be limited to the size of the pieces exclusively. If you are considering purchasing both chessboard and chess pieces, then choose the board first to fit your home, then pick pieces appropriate for that chessboard, in that order. 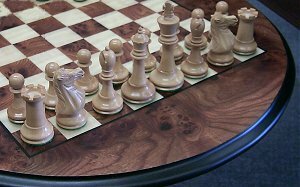 If you follow this guideline when selecting a chessboard and chess pieces you can be sure that the proportions will be pleasing. If you want the pieces a bit more close together than in the above images, add 5% and if you like more space subtract 5% from the guideline. We feel that if you increase or decrease the proportions greater than +/- 5%, you will end up in the situation mentioned above. Follow this guideline for "Staunton pattern" chessmen. But what about non-Staunton sets? This gets a bit more difficult, since the proportions of height to base diameter varies greatly in non-Staunton chessmen. In addition, some chessmen are wider at some point then the diameter of their bases. Such is the case of the chess set pictured in Fig. 1-6, where the royal garb of King George extend out beyond the diameter of the base. This chessboard is the smallest size we recommend. This Palisander chessboard has squares measuring 2 3/4", which is one of the larger chessboards in our selection. Figure 1-7: King George needs a diet or a new tailor! This is one of those cases where you probably need to give us a call. That's one of great things about Your Move Chess & Games; we always have someone here to answer any of your specific questions. If you have any questions just give us a call and we would be happy to help you in your choices. Another common question by our customers is,"What color chess pieces go with this color chessboard? ", or visa versa. Now we enter a world as vague as the Twilight Zone! We have distilled this down to two basic issues. Matching the pieces and chess board aesthetically or the pieces and board having high relative contrast for the ease of playing a game. Let's examine the former first and then return to understand the latter. Matching the pieces and chessboard together for an aesthetically pleasing look is relatively simple. One usually considers the dark pieces and playing squares of each, and then match them accordingly. 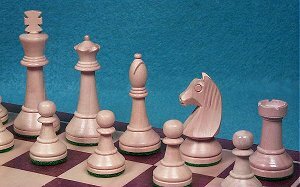 Most white side chess pieces, made from wood, are carved fromBoxwood. With chessboards, the white square are usually made fromMaple,AspenorErable. This should be of little concern. The dark side (no intentional reference here to Darth Vader) can be comprised of many different "flavors" of woods or materials. If you would like , go to our Wonderful Woods pages to learn all about the subject of woods used in manufacture of pieces and chessboards. When aesthetics is the primary concern, we usually recommend to consider where the board will be used. Let's say you have a beautifulMahogany table that you plan to display and play on. Then obviously aMahogany chessboard would be a good choice. Then you could choose pieces in aHoney Rosewood, or even a Crimson Rosewood, which would go with it very nicely. 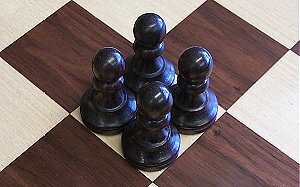 Figure 1-7 shows our Brown & Natural chess set with one of our large Mahogany chessboards. As you can see the chess pieces and chessboard match nicely, in terms of color. Hopefully this guideline was as fun for you as it was for me to write it.